Painting Clay Pots With Paint or Glaze? Painting clay pots is fun. Find ceramic paint ideas, techniques and supplies here. Whether using paint brush or paint pens, have fun painting clay pots with paints. An important thing to know about pottery is the difference between ceramic paint and ceramic glaze. I'll explain what the difference is between the two, and offer some ideas, and techniques about how each can be used to decorate your clay pot projects. Paint- We all know what paint is. We find it everywhere; the walls of your house, the outside of your car, on works of art. Paint can include many materials such as acrylic, oil, and enamel. What makes paint unique is that it is simply applied to a surface and when it dries it is ready for use. 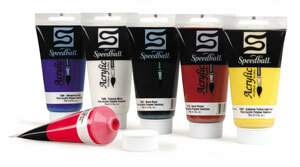 Many different types of paint can be used on ceramics such as the acrylic paints above. There are also special paints that are designed for use on clay. Glaze- Glaze is another thing entirely. 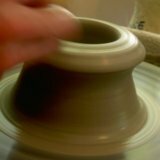 Glazes have to be fired in order to work properly. 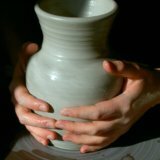 Pottery glazes are liquids which are a combination of minerals mixed with water. These liquids are then applied to the surface of the pottery and fired in a kiln. The glazed pots are fired to high temperatures (about 1000-2500 degrees Fahrenheit). The glaze melts and forms a glassy surface on the pot. This surface can be very hard and durable, enabling the pot to hold liquid and be used with food. Tip: The words paint and glaze are often confused. As long as you see the word "glaze", you can bet that they are referring to glaze (the kind that must be fired), not paint. 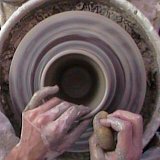 Example: If someone talks about "painting clay pots with glaze" it implies that they will be "glazing" the pots by "brushing" on layers of glaze and then firing them in the kiln. If they refer simply to "painting clay pots" then they are likely using regular paint, such as acrylic paint. Painting- If you decorate your pot with ceramic paint or acrylic paint, you don't have to fire it a second time. In fact, make sure NOT to fire pottery in a kiln if you have applied regular paint to it. If you use paint instead of glaze, it won't be usable with food, and it most likely will not hold water. It will also be less durable than a glazed pot. On the other hand paint is, "What you see is what you get." If you paint a landscape with a green tree and a blue sky, it will stay that way on your pot. You have a lot of control over the colors, detail, and brightness of your design with paint. 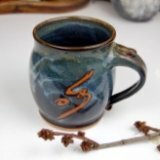 Many of the same techniques that you would use for painting on a canvas can be used to paint ceramics. Painting ideas such as layering, landscape, line drawing, and perspective can all be incorporated into painting a ceramic pot. Generally speaking, I would recommend using an acrylic paint (such as the ones featured above) or a specific ceramic paint. These can be found at craft stores or possibly a ceramics supply store. Acrylics will be easier to use on pottery than an oil-based paint. Glazing- If you glaze your pot, you can make it very strong, watertight, food safe, and durable. However, you may have less control over the colors, and the glazed pot will have to be fired a second time. Glaze rarely looks the same when you apply it as it will after it is fired so it requires some planning and testing. Example: I apply a rusty, red, chalky looking glaze to a pot. After I fire it, I have a beautiful, glossy, robin's egg blue, with hints of earthy brown around the edges. 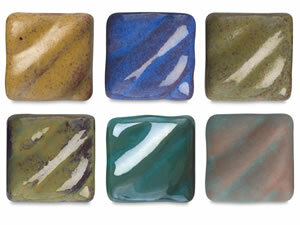 Glazes also move and melt when fired in ceramic kilns. This means that your tree design might turn out blurry after the glaze melts. There are, however, inventions, such as underglazes and stains that help to minimize this effect in pottery. So, the answer to the question, "Paint or Glaze?" really is either one. It just depends on what you want to do with the pot, how you want it to look, and whether you want to fire the pot again.